My collection of Woman’s Own magazines is quickly becoming one of my most prized possessions. I adore flicking through them, admiring the adverts, drooling over the fashion and wishing I could draw like Aubrey Rix, Joe de Mers or Coby Whitmore. One of the things I love about them is that they are mainly for the working class to lower middle class woman; they are aimed at the every day women of the era and really give an insight into the mindset of the time. A Vogue magazine is something different. Just like the magazine today, it is more aspirational, a dream and definitely not mundane. 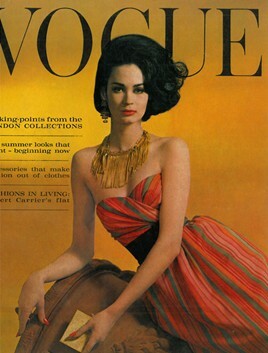 Although prices for the vintage Vogue magazines of the ’50s and ’60s can be anything up to fifty pounds, I would adore to have one – just one – to admire the high fashion, photography and illustration. The model on the cover of the March 1962 edition looks stunning: like something Louis Shabner or J.H. Lynch would paint. And I love the design of the 1954 cover, especially the jewelled detail. What’s at the top of your Christmas wish list? Vogue.co.uk – where all of these pictures came from. There’s an archive here of back issues with details of the features and articles in each one. 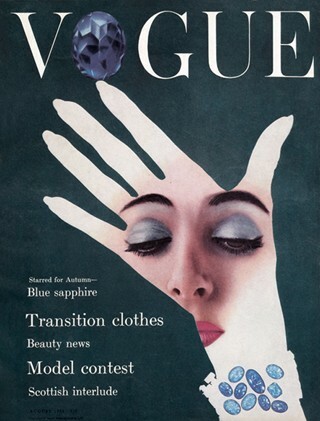 Just stumbled upon your site – wow, what wonderful illustrations of vintage Vogue covers – they represent my youth and the great attitude to women and fashion of the 50s’ & 60s’ – no scruffy grunge then!!! Decorum was everything and I am very thankful I experienced that era. I own two wonderful editions of English Vogue 1962 with Shrimpton on the cover!